During my first test and learning tour, with Eric, I tagged along with 2 couples from San Diego, who planned their vacation in Philadelphia around Restaurant Week. Talk about good planners and smart eaters! Eric brought us to, and soon I will too, three stops in the city, Cheese at DiBruno Bros.; Chocolate at Naked Chocolate; Tea at TBar. 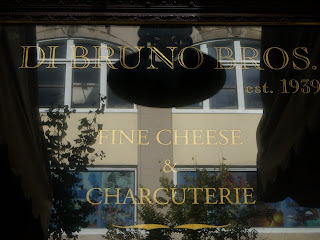 1st Stop - DiBruno Brothers store at 18th and Chestnut Street, for a cheese tasting. We sampled a young gouda, a Swiss, some Bleu, and a version of Parmigiana Reggiano. 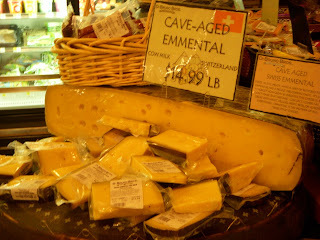 This is a giant, wagon wheel-sized round of Emmental cheese. You can see the top half of the wheel, and underneath, is the whole wheel. Don't be scared of the Bleu! As part of the lesson in cheese, we learned that some mold is good mold. 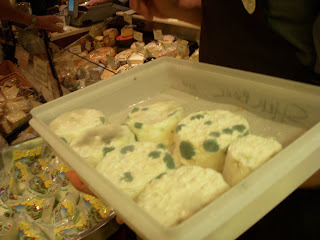 Here's a "science" experiment where the cheeses have been allowed to grow mold, in order to show what the process looks like, and to show what kinds of molds are good and bad. Hey, mold is an every day occurrence, mostly only bad in the bath tub and walls of your house, not necessarily in or on your cheeses. Lucky for us, this was not part of the tasting sample. The cheese they offer is better looking and tastier too. Mmm, chocolate. All that good dark chocolate is rich in antioxidants and full of nuances, with tastes ranging from wine and raisins, berries or coffee. The folks at Naked Chocolate - 13th & Walnut Street, (off of Juniper between Broad and 13th) - arranged a plate of chocolates to sample. 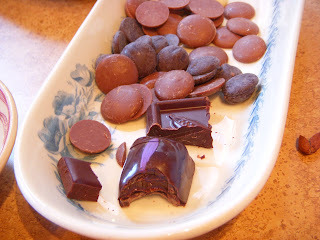 Disks of white, milk and dark chocolates used for making confections, as well as finished bars of dark and varietal chocolate pieces. To finish off the tasting, a lavender honey truffle was savored last. Snappy outer shell, filled with dark chocolate ganache infused with the essence of lavender and sweetened with honey. The purple stripe across the top of the truffle is chocolate "paint". 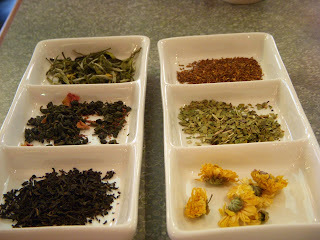 Tea leaves and herbal infussions at TBar - 117 S. 12th Street (between Chestnut and Sansom on 12th St.) In the left tray from top to bottom: white tea leaves; gun-powder green tea leaves with peaches; black tea leaves. On the right tray, top to bottom: roobios; jasmine; chrysanthemums. 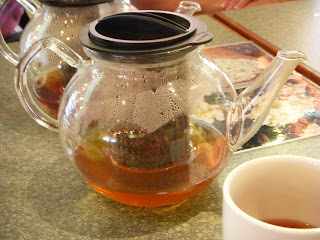 The ladies at TBar brewed up several different teas for us to sip, starting with white tea and finishing with a bubble pearl tea drink. I'm almost ready to switch my caffeine habit from coffee to tea. As an afternoon cuppa walking down to 12th and Sansom street is worth the trip. TBar is a charming and relaxing place to visit. Serene, Zen and at the same time, filled with a rejuvenating energy that will help right your mood or day. On a side note, there have been no further developments with the cricket cookery - I've been too busy lately to devote any time to my other projects. Ideas are in the crockpot of my brain, but as of yet, I don't have a date set for a tasting. However, anyone out there who might even be remotely interested in joining my merry band of cricket tasters is still invited to inquire, participate or brave a bite with me. Leave your comments here, or send me an email: dgorniak@comcast.net My best guess is that I'll hold an event within the next 3 weeks. I've been to Di Bruno Bros, in PA and the cheese selection is phenomenal. The design of the market is so perfect. With those fruits, cheese, meats, dried/roasted goods then checkouts. Everything you need for your cooking is available here. Truly remarkable.